Engineering Evaluation/Cost Analysis and Action Memo for Three Former UST Sites - Noreas Inc. Under a multiple-task order contract for environmental compliance and restoration work at Marine Corps installations, NOREAS prepared an Engineering Evaluation/Cost Analysis (EE/CA) and Action Memorandum for three Non-Time Critical Removal Actions (NTCRAs) to respond to releases of hazardous substances at Installation Restoration Program (IRP) Site 1116 at MCB Camp Pendleton (MCBCP) which includes UST Sites 1491, 14112 and 140008. Contaminants of concern included chloroethenes (mainly TCE) and petroleum-related volatile organic compounds in soil and groundwater, including a large area of LNAPL. NOREAS reviewed historical data and determined that there were a number of areas with mixed, complex distributions of soil and groundwater contamination, including soil hot spots, phase-separated hydrocarbons, and dilute groundwater plumes influenced by highly variable groundwater flow direction. 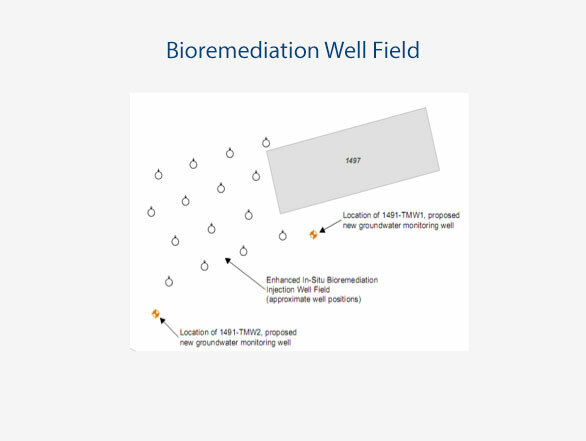 Accordingly, a range of appropriate technologies were initially screened for each site based on implementability, effectiveness, and cost: excavation/shallow groundwater extraction, automated phase-separated hydrocarbon extraction, dual-phase extraction, MNA, anaerobic and aerobic bioremediation, zero valent iron, thermal treatment, and in situ chemical oxidation. Treatments that passed the initial screening were combined to form complete treatment alternatives designed to address the various phases of contamination present at each site, which were screened against the CERCLA “nine criteria”. NOREAS also prepared an Action Memorandum in support of the NTCRAs. Both the EE/CA and Action Memorandum were approved by the regulatory agencies with minimal comments.